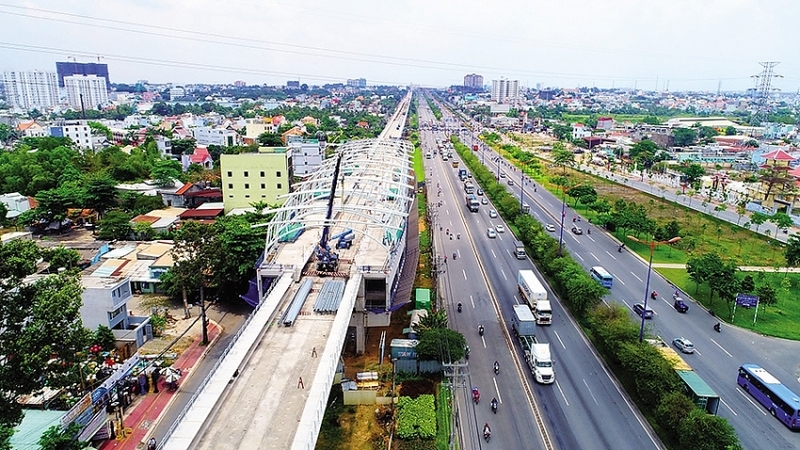 Recent moves to speed up the operation of Ho Chi Minh City’s first metro line have brought new hopes of a rise of property prices along the route after years of delays. 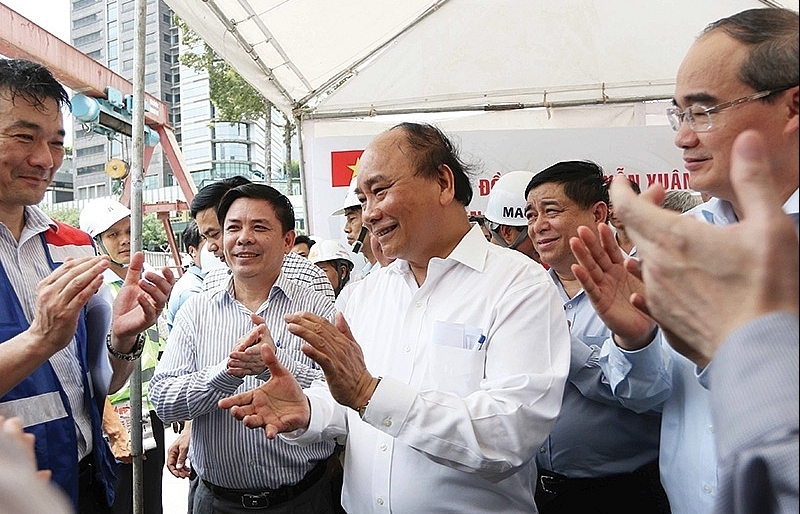 Secretary of the Ho Chi Minh City People’s Party Committee Nguyen Thien Nhan last week proposed the government to give in advance a sum of VND2.15 trillion ($93.5 million) from central or local authorities to pay the debt for contractors constructing the line at Ben Thanh –Suoi Tien. 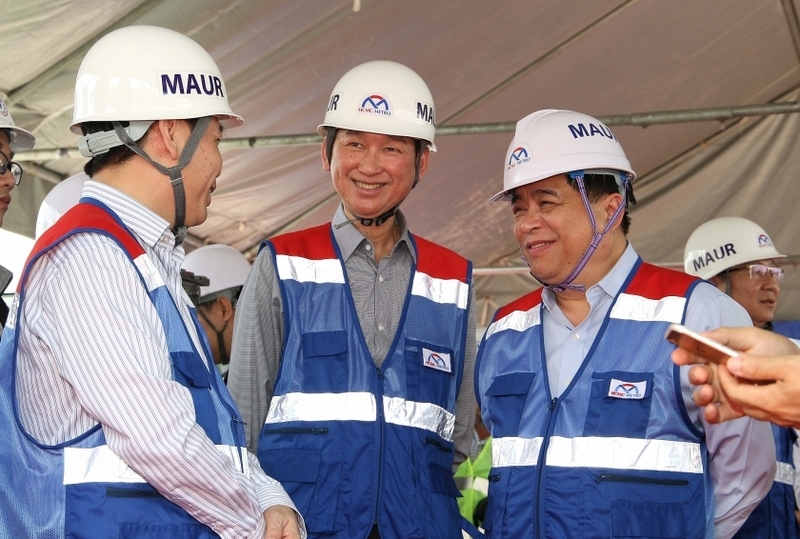 Nhan requested that local authorities do careful research to explore the land along each side, with hopes that a land fund could become a remarkable financial source to turn back into investment for the metro system. 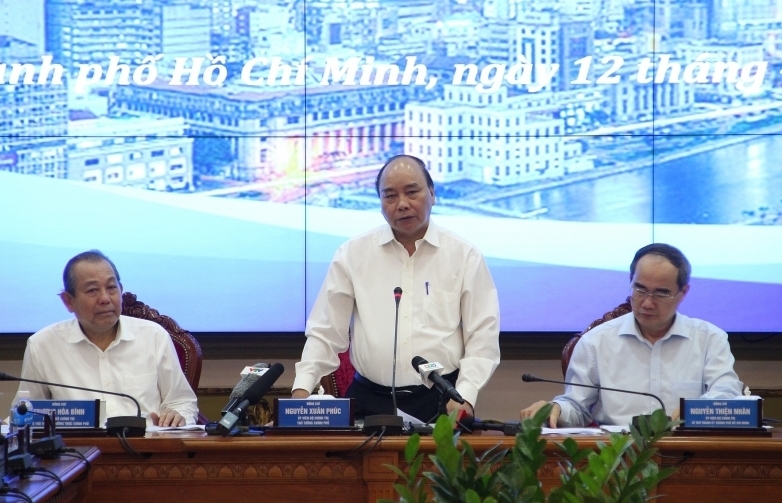 He also requested that the plan to use land areas along the system must be submitted to the committee by April. 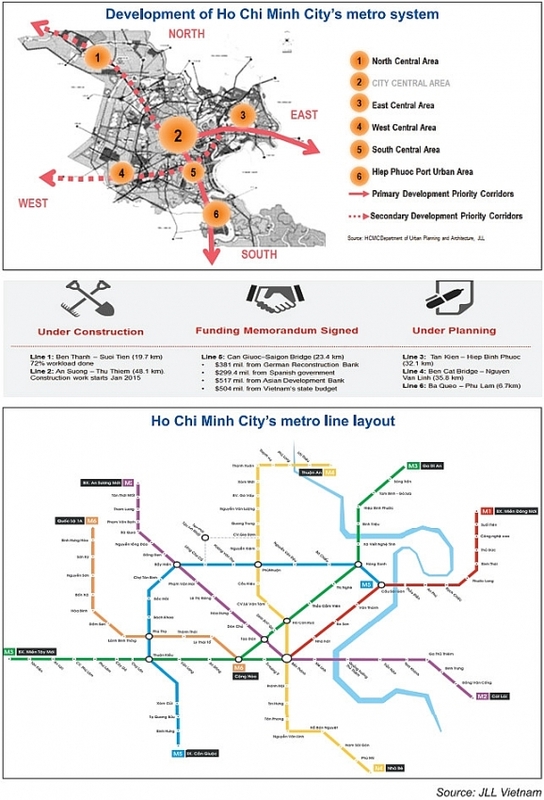 The Ho Chi Minh City Department for Planning and Architecture noted that it started initial research to develop high-rise buildings, trading centres, and other service constructions along the city’s first metro line. 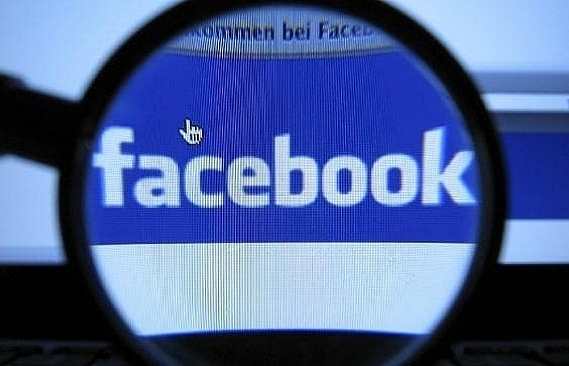 All of the current projects, however, are under construction by the private sector. 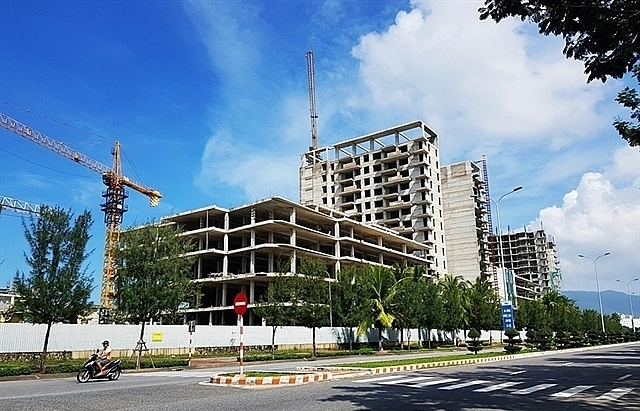 Property service provider CBRE Vietnam has forecast that land prices within a 10-minute walking distance of metro stations would be from 10 to 20 per cent higher than those in other areas. 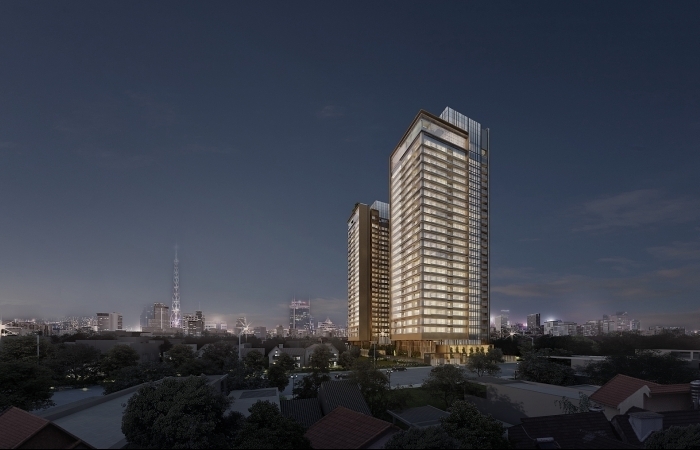 Meanwhile Stephen Wyatt, director of JLL Vietnam, told VIR that traffic congestion has become a way of life for many of Southeast Asia’s cities, causing major issues. It is not only adding significant time to the daily commute but it is also having a negative impact on public health and the environment. 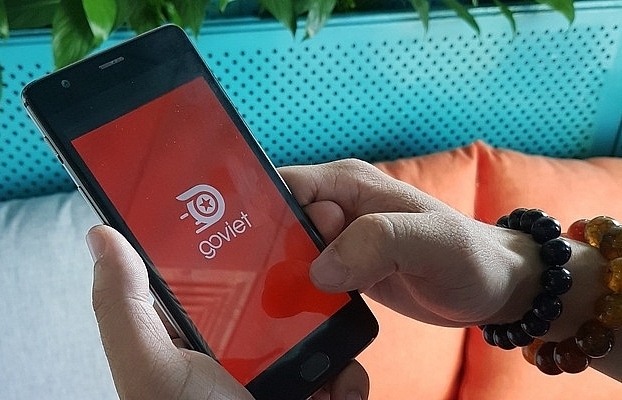 “As Ho Chi Minh City’s official population is set to increase to more than 10 million by 2025, we can already see the city’s infrastructure buckling under the pressure, and we expect the current situation to get worse,” said Wyatt. The development of the metro system, Wyatt said, has had a strong impact on real estate development. 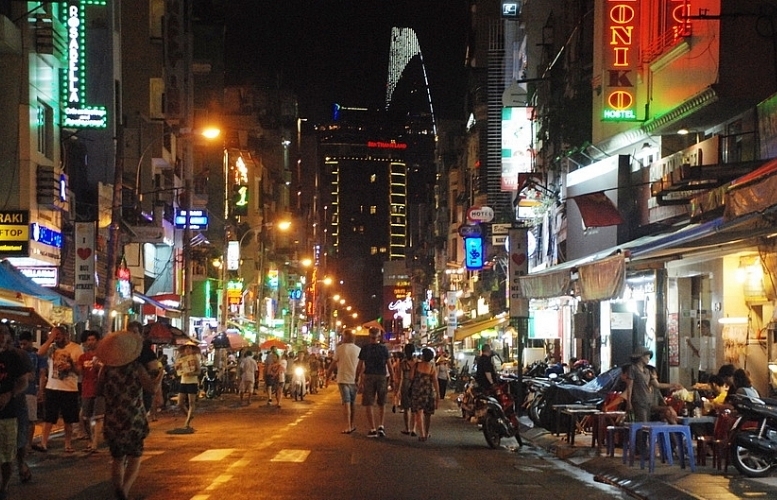 In Ho Chi Minh City, property development has been booming along the Metro Line No. 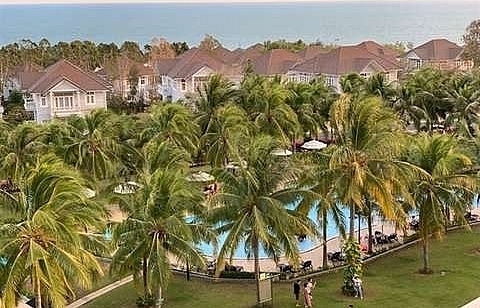 1 since construction began, which in turn gave a boost to land price growth in the area. Generally, completion of the route should have some positive effects on the real estate market, Wyatt analysed. As almost all projects alongside the metro line have been launched with very good sale rates thus far, completion of the line on secondary markets will be more evident with an expected increase in both number of transactions and price. 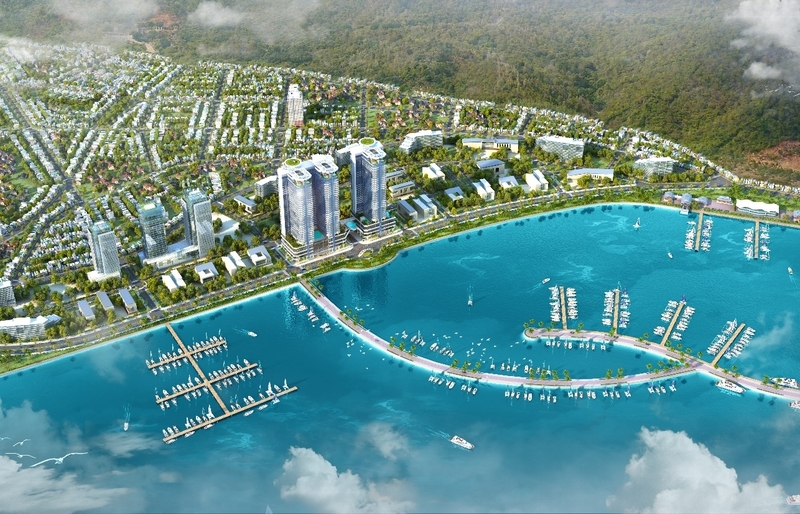 Secondly, completion will also help extend the urban area further east of the city. As there is still a large available land bank in District 9, the real estate market in this location will likely become one of the most sought-after investment locations. In many countries, a metro system has significant effects on real estate development, resulting in land prices rising and property projects booming. 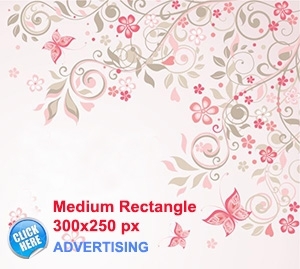 Retail and office premises especially are often located further away from the city centre. 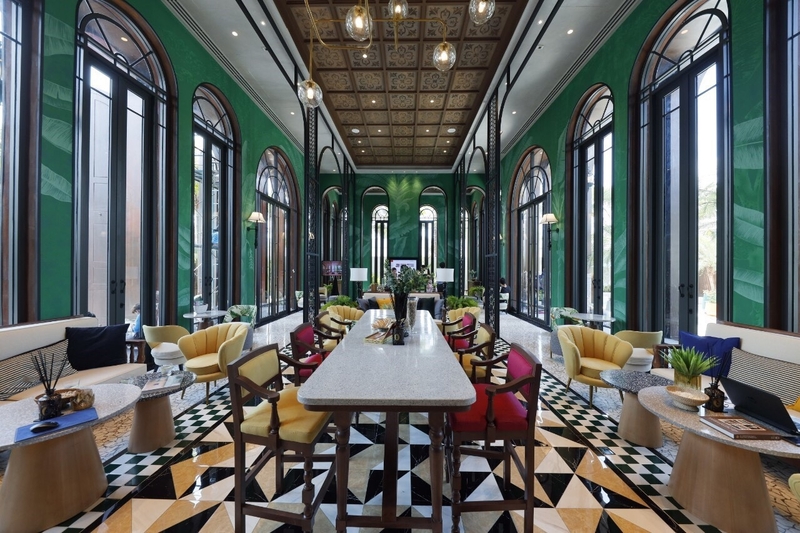 For instance, there have been marked changes in real estate purchasing behaviour and the travel habits of residents in the Thai capital of Bangkok since metro lines came into service. Thais have become increasingly dependent on cars instead of motorcycles and travel frequently to suburban areas. Notably, the number of property products along metro routes has increased by an average of 10 per cent compared to other areas. Multiple housing projects have been developed along the metro line since 2012. Over 132,000 units offered for sale, around 43 per cent of total launches, come from projects located along Metro Line No.1 in the last seven years. 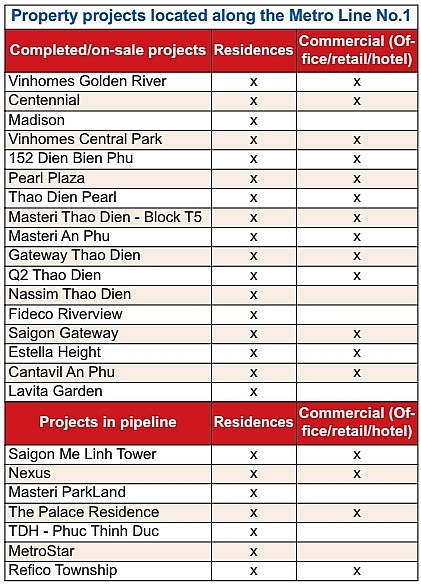 Many real estate projects have been implemented in the area, including Thao Dien Pearl, Masteri Thao Dien, Lavita Garden and Moonlight Garden, and Him Lam Phu An. 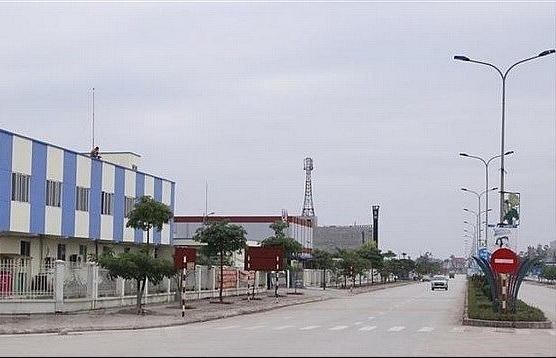 Several projects have also emerged along the planned Metro Line No.2 route, linking Ben Thanh Market and Tham Luong in District 12, such as Depot Metro Tower, Rich Star, Southern Dragon, and Melody Residence. Many other ventures, on the other hand, remain under construction. 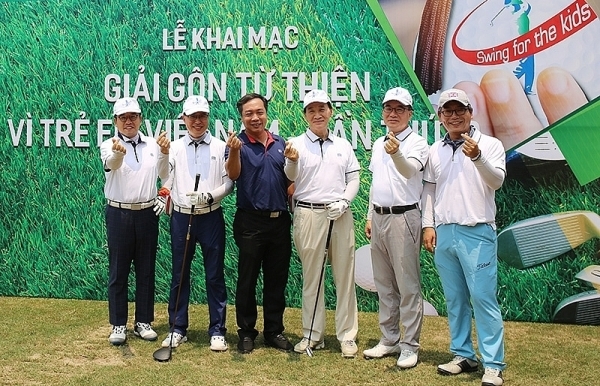 Among those are the The Palace Residence investment by Novaland, the Mastery ParkLand funded by Thao Dien Investment, and MetroStar from Singaporean developer Solbuild Group, in co-operation with CT Group. The MetroStar project resumed recently after many years of delay by CT Group. Once a mid-end project initiated before 2015, the plan was then rebuilt to a high-end residential project with participation of Solbuild Group.